There was a quiet buzz of energy in half the bar. Sports games flickered on 31 televisions, but few people were watching them. They were looking at Andrew Dorfman. He stood at a podium at the back of the room, a homburg hat pushed back on his head. He leaned in conspiratorially towards the microphone. The crowd erupted, and Geeks versus Nerds began. The audience clapped along to the theme music as Dorfman introduced the debate: Which traitor do you hate to love? Starscream or Lando Calrissian. The monthly comedy show started as a podcast in Dorfman’s living room in 2010. It has kept going for six years, despite a decline in attendance at live shows and the shuttering of its online magazine in June 2015. The show is a community of comedy; a gathering of geeks willing to sling a few f-bombs and ruffle a few fandoms. And that connection of art and kinship is what keeps Geeks versus Nerds going. On Feb. 16, the community came to Bubba Rays Too in west-end Halifax well before the show, paying $5 at the door and ordering burgers, beer, nachos and bottles of Coke. Dorfman said the sports bar is a good fit for Geeks versus Nerds. “It’s the atmosphere that we were looking for where we started originally. At 8 p.m., when Léo Melanson announced the pre-show, the geek half of the bar quieted down. The pre-show is made up of five two-minute debates. These debates are used as auditions for people wanting to become full-fledged debaters. Melanson doesn’t usually host the two-minute debates – he’s a regular in the main show. For him, the connection of community and comedy is what makes Geeks versus Nerds special. “You can go online and you can find a dozen people on any website discussing the merits of Batman versus Superman, Kirk versus Picard,” he said. Humour is the backbone of a Geeks versus Nerds debate. Team Geek, supporting the transformer Starscream, was led by Nick Parson, wearing a pink cloak and handmade crown. Team Nerd, supporting Star Wars’ Lando Calrissian, had Carey Lee dressed as Han Solo and pretending to be Christopher Walken. “What we’re asking is who do we hate to love,” Shawn Kehoe (Team Geek) said during the debate. Team Nerd had just finished promoting Lando – with an aside from the fake Walken. The audience’s response sounded like a pre-recorded laugh track, but it wasn’t. It was raw. Maria Brine, one of the regulars at Geeks versus Nerds, said this is one of the things that makes Geeks versus Nerds special. She first started listening to the podcast from her home in New Brunswick in 2010. When she moved to Halifax three years later, she started going to the live shows. “We sit around and drink and whatever at home, and talk about exactly these debates on our own,” she said. The winner of every debate is decided by the strength of the cheers at the end. The audience can give suggestions for that show’s go-call – the line that marks the opening of the show. At February’s debate, a woman sitting with Melanson called out a line from the new Deadpool movie, and that avocado quote was used as the go-call. “This show wouldn’t survive if we didn’t have a community to support it,” Dorfman said. 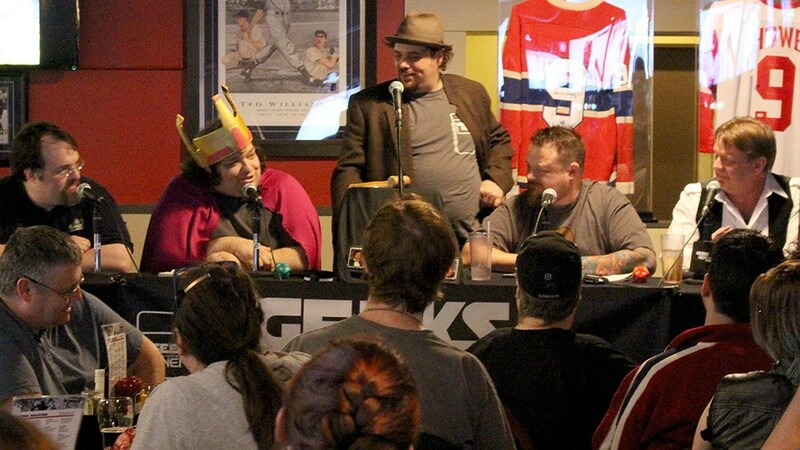 In 2012, Dorfman said attendance at Geeks versus Nerds was never less than 80 people; when the show was at the Bus Stop Theatre on Gottingen in 2015, it was closer to 60. It has fallen further since last winter. Now it’s closer to 40 or 50. The core of the community seems stable and loyal. The burger-eating, beer-drinking audience cheered when Nick Parson faltered on his joke and Dorfman announced a do-over. And at the end of the debate, they were quiet when Team Nerd announced that they just got a text from the other team. “Slightly used,” Kehoe added from across the table. There was laughter and cheering, and it grew louder as the Nerds took the deal. It is these moments that make the show more than just a show. It is a connection for the people who are there month after month.